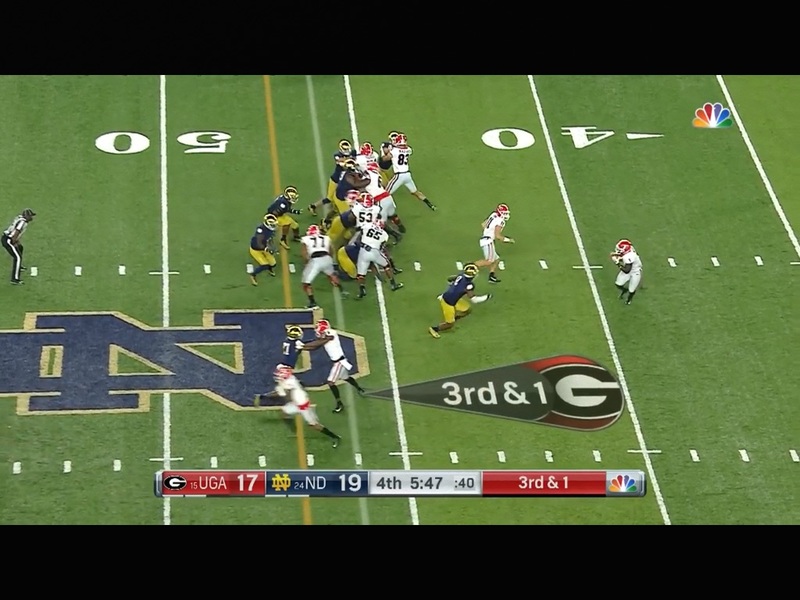 One of the things I’ve noticed over the last few days of doing these is that Notre Dame didn’t do a good job adjusting protection or picking up blitzes. 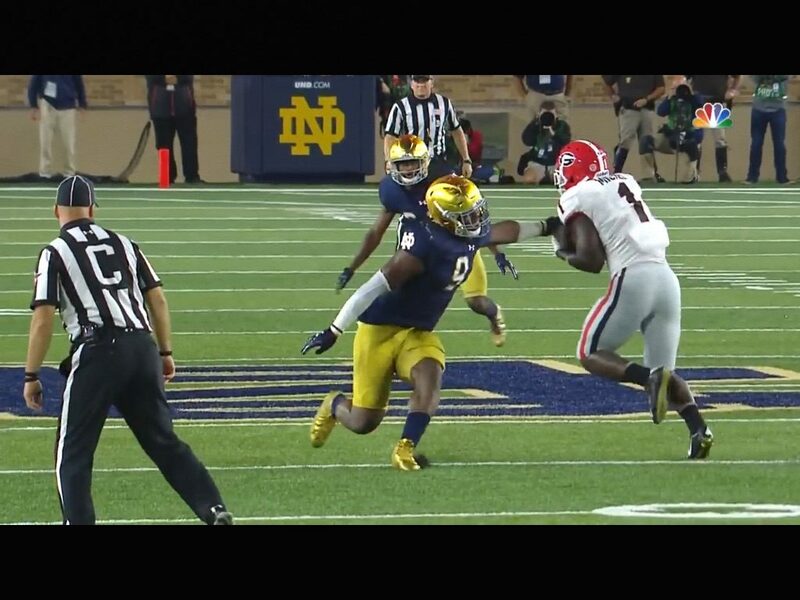 Roquan Smith is showing he’s coming, so you have to account for that body language. He backs out, and then comes on what looks like a delay. 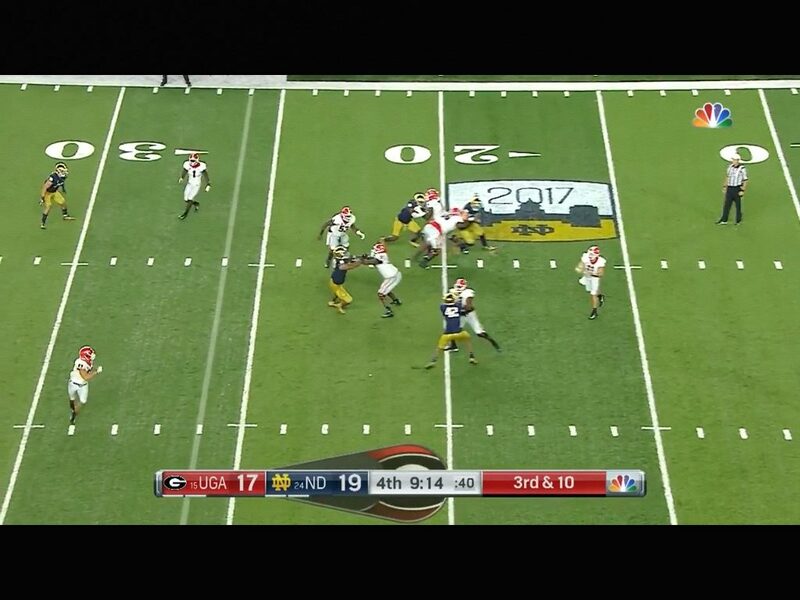 And in the meantime, you have three interior linemen blocking two guys. They need to pass off this protection better and pick him up. Wimbush was still able to complete the pass, but you don’t want to get your qb hit like this. Georgia has probably been watching Iowa State & West Virginia tape. In neither game did the Sooners have an answer for the wildcat game. 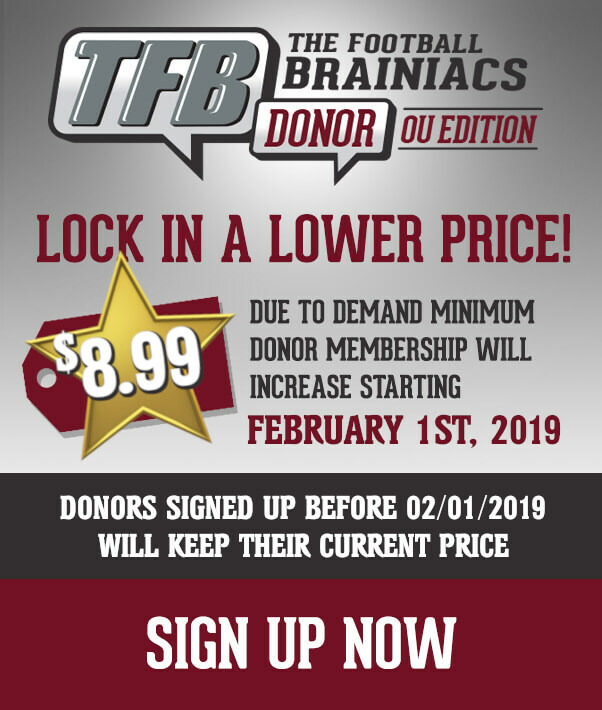 Hopefully Mike Stoops and company are drilling this right now. 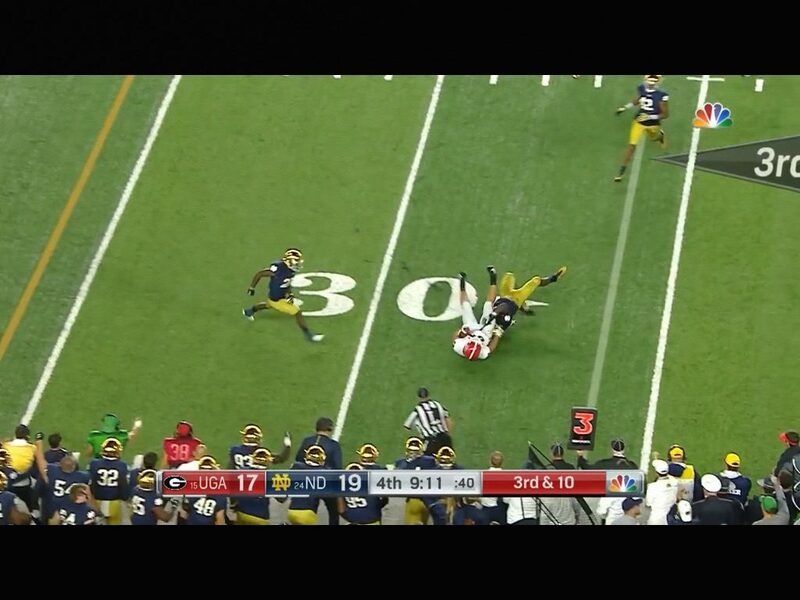 Michel probably should have kept the ball here, but gave it. The DB does an outstanding job keeping his outside arm free and keeping contain. 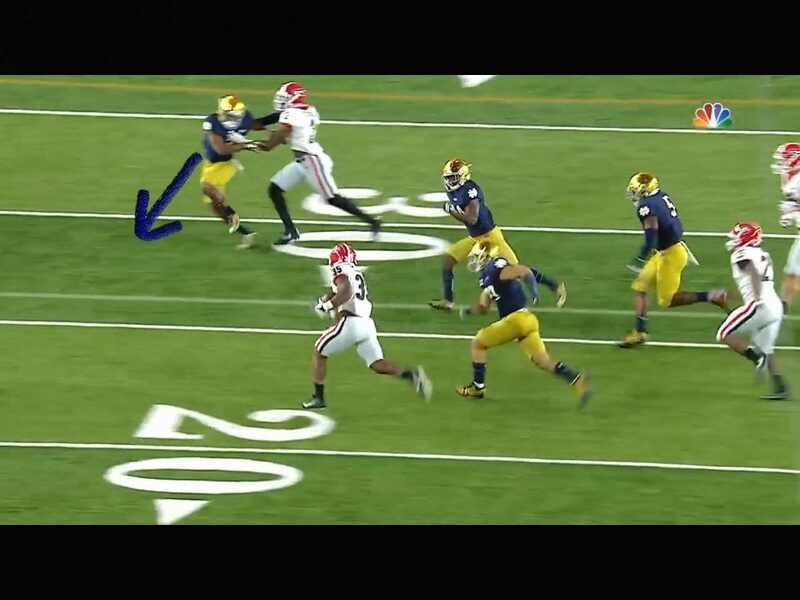 This is good pursuit by the Irish defense, and the back can’t hit the corner because of how well the DB contained him. 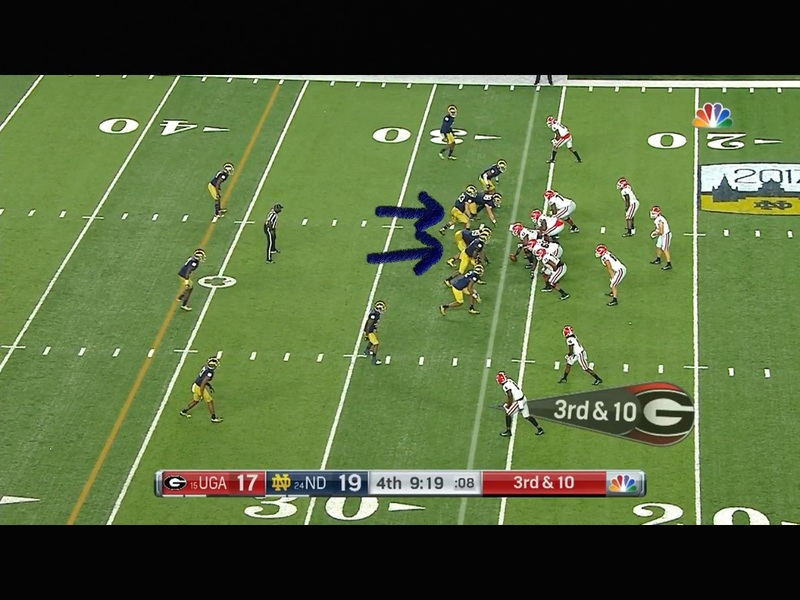 Pre-Snap Fromm reads blitz. 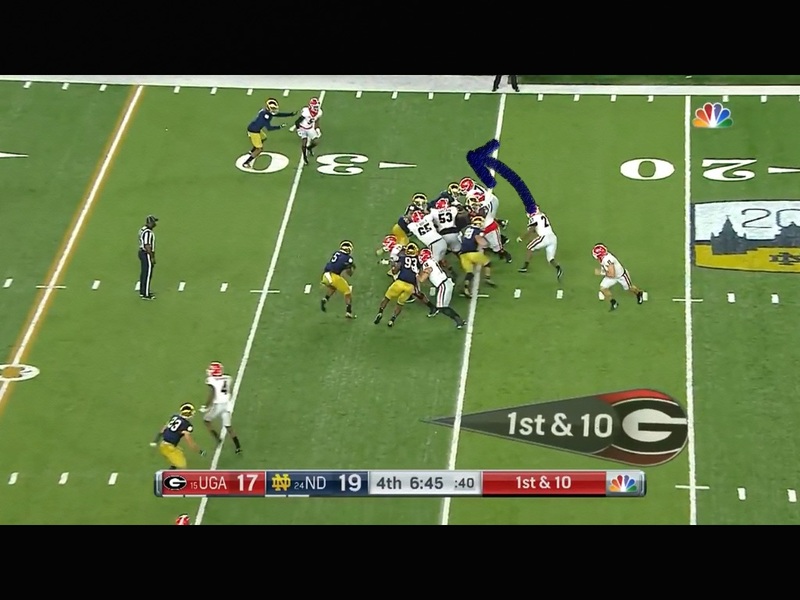 The two inside backers are showing coming, so he has to account for it. On the snap he doesn’t notice that the linebackers both drop. 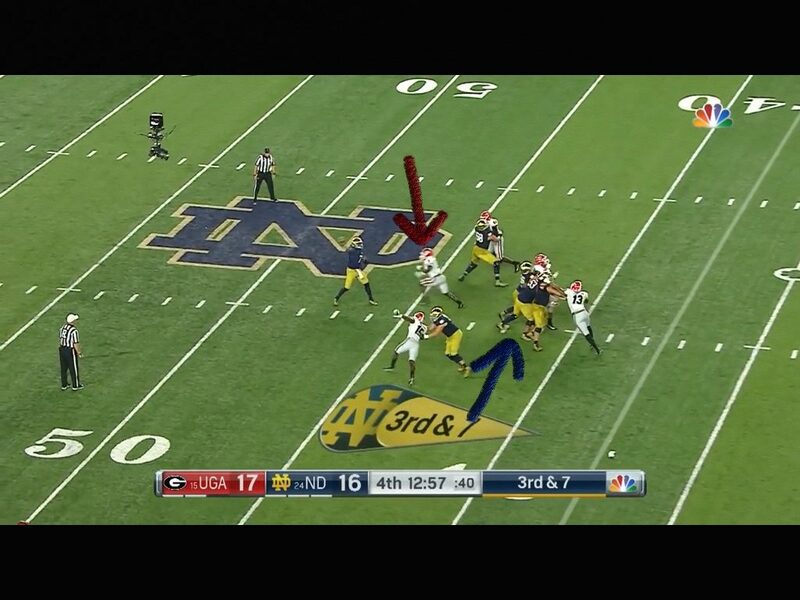 He still goes with the hot read to his tight end despite not having any pressure at all. 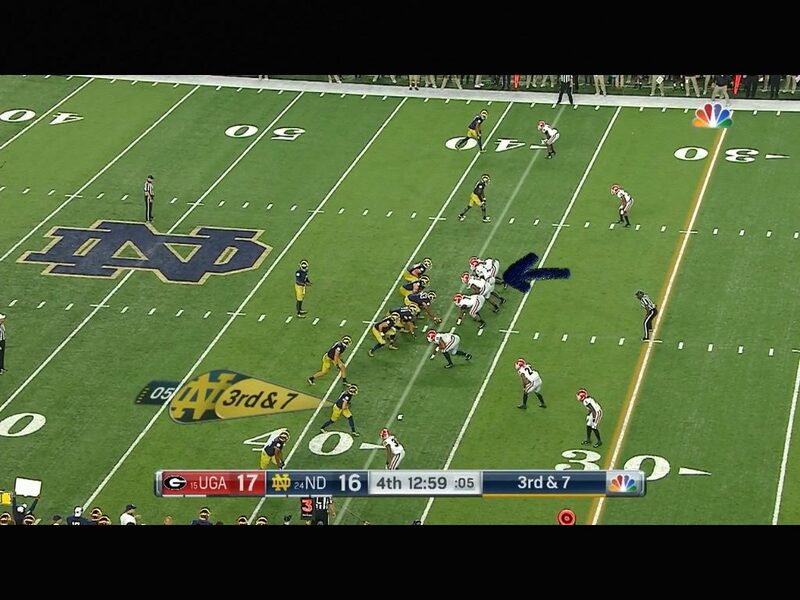 Maybe the Sooners can show pressure and give him a lot of different looks and rush his clock. On 3rd and 10, the pre-snap look causes a quick throw and a stop. If the Sooners can get them to 3rd and long and show pressure they can get them off the field. 3rd and 4 or less is trouble. Over the past few weeks I’ve heard how Oklahoma drubbed Ohio State. Well, while the Sooners did win going away, J.K. Dobbins averaged 5.5 yards per carry while Mike Weber averaged 9.7. In a close game, I couldn’t understand why Ohio State got away from the runs by the backs. 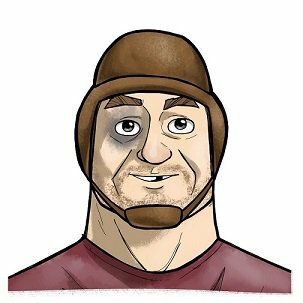 Nick Chubb is 2nd all time for Georgia in rushing yardage with 4,599 yards. Who he’s 2nd to…Herschel Walker. He’s rushed for about 500 yards more than what Samaje Perine did. The bulldogs are going to feed him and Michel all night long. Going back to my earlier Samaje Perine comparison, he and Sony Michel are the closest thing we’ll see to Joe Mixon and Samaje as a tandem. The guys can play. 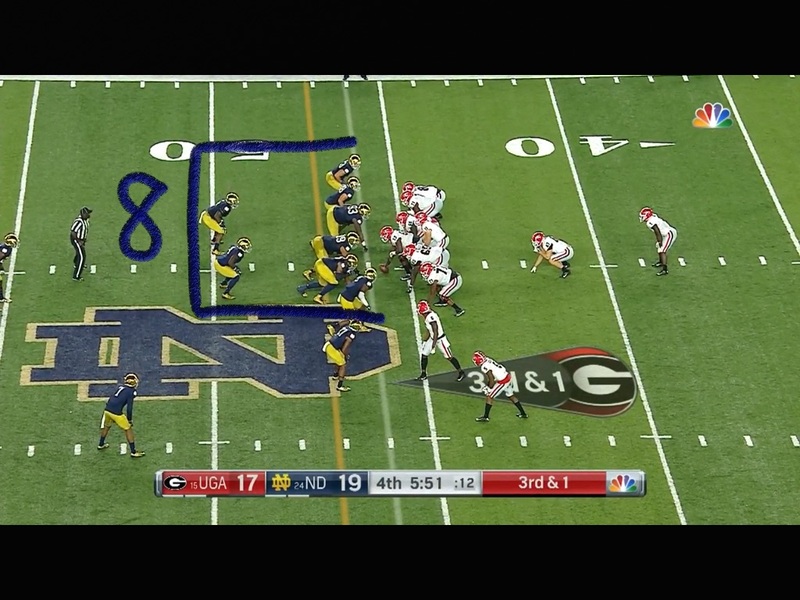 On a critical 3rd and 1, ND puts 8 in the box. 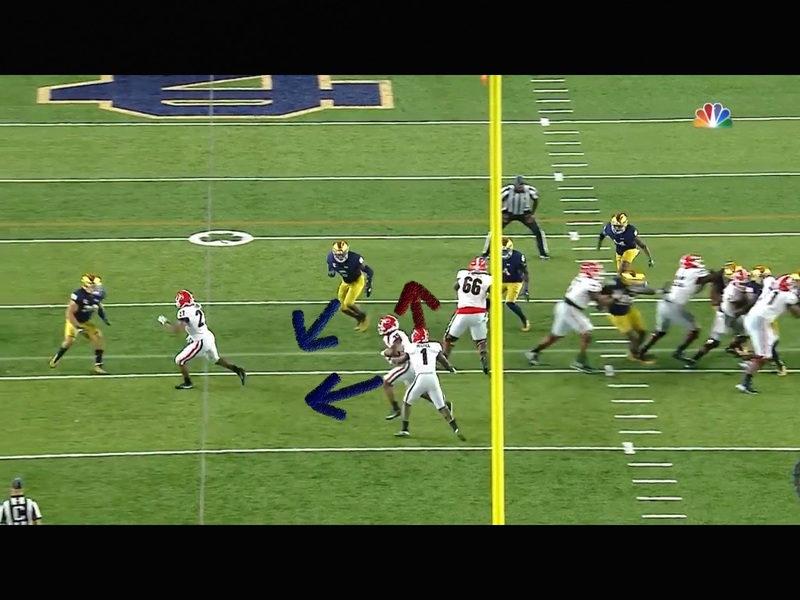 They fake the give to the fullback and run the naked pitch out to Sony Michel. 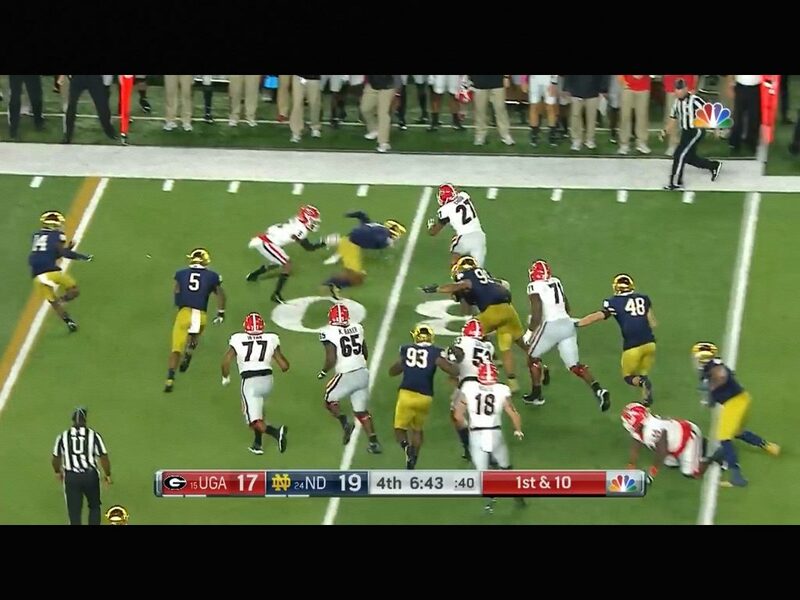 The Notre Dame defender has him dead to rights, but he gets too eager. Knowing down and distance here and just stopping him where you are rather than trying to get an 8 yard loss is what hurt him. In doing that he overruns Sony Michel and let’s him cut back up and get the 1st down. I think this is more about the Georgia running back’s ability to make him miss than it is him being fundamentally sound. These Georgia running backs are legit just like Dobbins and Weber were. If Georgia can run the ball and sticks with it, it’s gonna be tough.